I got a question from a friend of mine (Pieter Turcq) today, who asked me if it’s possible to use one single Project Site (in SharePoint) for both TFS and Project Server? Well, actually you can. In this post, I will show you what the requirements are and how you can easily achieve this. But first let me start with a brief ‘overview’ of how it looks like out of the box. 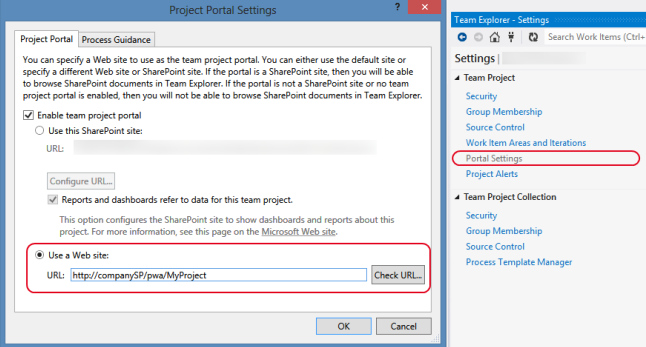 Note that this is a situation where the Project Portals from TFS are hosted on another SharePoint environment as the Project Sites of Project Server. (If they are hosted on the same environment, it will of course use a different Site Collection, but you will have less work to get to the end solution. I’ll explain this a bit later). Now, how can we get one Project Site for both systems? We have 2 options: A quick-and-dirty solution, or a decent solution. The first solution is really simple. What you do is pointing the Project Site from your TFS Team Project to the URL of your Project site of Project Server. You can do this using Visual Studio using Team Explorer. If you go to “Settings -> Portal Settings“. There you can set an option “Use a website“. It will now redirect to your Project Server’s Project Site. That’s all. Nothing more, nothing less. It will have no interactivity with TFS or what-so-ever, you will not see the Project Site documents in your Visual Studio, you will not have any dashboards on your Project site,.. So this is not an option. Let’s move on. A better solution is to make it possible to let the Project Server’s Project Site behave like it would have been a “standard” TFS Project Portal. If your are in the same situation like the one I’ve illustrated, you must install and configure the Team Foundation Server extensions for SharePoint Products on the remote portal. If not, you can skip this step, and no actions related to this need to be executed! 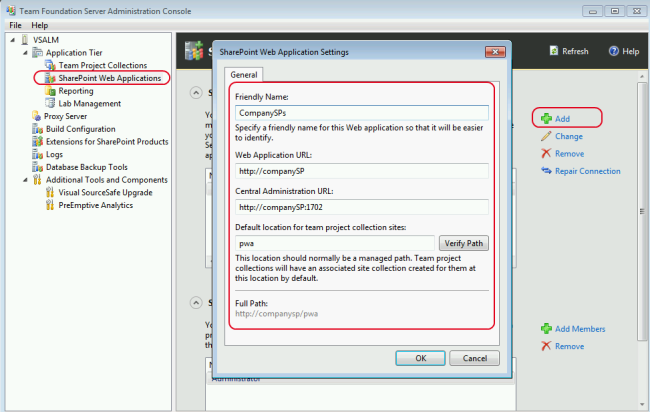 This is a step that has to be executed for ALL SharePoint application servers. It contains the necessary Web Parts and some dashboards. You have some excellent guides for this, but it really is a straight forward process. Just make sure that you have the right permissions, and especially that the TFSService account that needs to a Farm Administrator. Note: It is import to know that when creating a new Team Project in TFS, we will NOT allow the wizard to create a Project Portal. Because if you don’t watch out, it will create one on your PWA instance directly. This is not the behavior that we want. We want Project Server to create Project site, and link our TFS Team Project to that site manually. So be careful! In this example, I use the TailspinToys Project Site from Project Server, to be used as TFS Project Portal from TFS. Be sure to select the check box “Reports and dashboards refer to data for this team project“. Click Ok. If you now go back to Team Explorer and select the “Documents” node, you will see the content of the documents library from you Project Server’s Project site. Mission accomplished.. or not? Well, it’s great to have the documents library available from your Project Site. But wouldn’t it be cool if you could also use this Project Site to add your TFS Dashboards, and some TFS Related Web Parts? Well, actually you can! If you open your project’s Project Site (in Project Server), and go to “Site Settings -> Site Features“. And activate the dashboard you need. 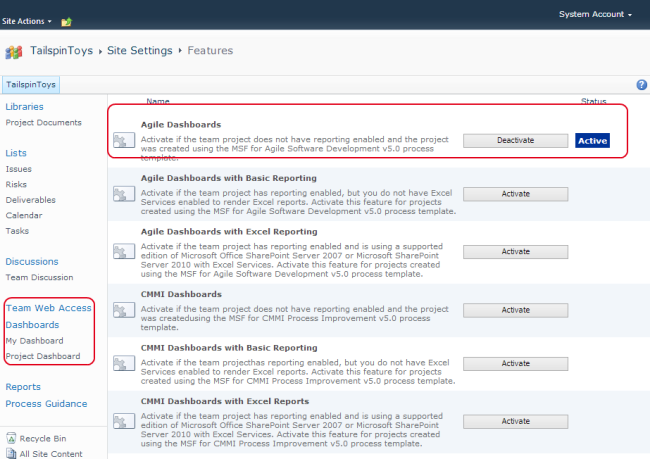 In my case, it’s a TFS Team Project based on the Agile Process Template, so I selected “Agile Dashboard“. If you click activate, you will see some new items in the menu on the left side. That’s exactly what we need. This way, we can also change whatever we want, and we can even add the TFS specific Web Parts like a Work Item Query list. That’s pretty cool! So there you have it, one single Project Site/Project portal for both TFS and Project Server. Have fun! 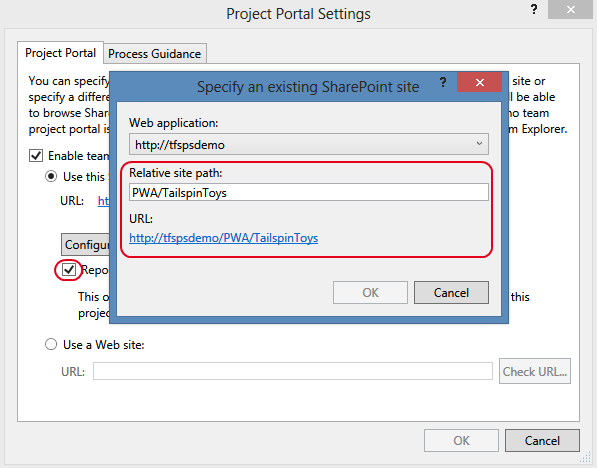 Note, when Project Server was not on the same SharePoint instance as TFS, and you followed the previous steps using the TFS Administration Console, and you don’t see the dashboards listed in the features list, be sure that it’s enabled in the Web Application of your PWA! You can check this using the “Central Administration -> Application Management -> Web Applications -> Web Application -> Manage Features“. It should be enabled by default, but you never know! Next to that, if you don’t see any web parts related to TFS, look at the Site Collection Features, and be sure that “Visual Studio Team Foundation Server Web Part Collection” is activated. That’s all! This is very usefull! Thanks for the detailed walkthrough. Exactly what I needed. Nice post.